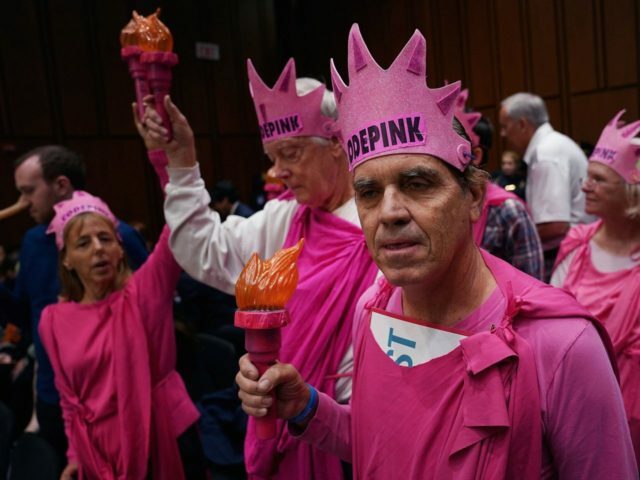 Code Pink, the radical left-wing anti-war group famous for disrupting congressional hearings, protested outside the San Francisco homes of House Minority Leader Nancy Pelosi (D-CA) and Sen. Dianne Feinstein (D-CA) on Saturday — even thought those Democrats share their skepticism of President Donald Trump’s attack on Syria. The anti-war group Code Pink protested Saturday outside the San Francisco homes of Sen. Dianne Feinstein and House Minority Leader Nancy Pelosi in response to the American-led missile strikes on Syria. They walked next to Pelosi’s home, also in Pacific Heights, where their message was the same. Later, the demonstrators were joined by several other groups at Market and Powell streets, where they condemned not only the strikes on Syria, but the U.S. support for Israel and a host of other issues. I’m continuing to monitor Syria in the aftermath of yesterday’s missile strikes. Assad must NOT be allowed to gas his citizens, but Congress also must be consulted regarding use of force. My thoughts are with our servicemen and women in harm’s way.